The included 2GB SD card contains 500 MB of drum loops from Big Fish Audio, one of the top producers of sample libraries. With an emphasis on rock, the collection of standard drum phrases can be used to create professional-sounding rhythm tracks just by lining them up. 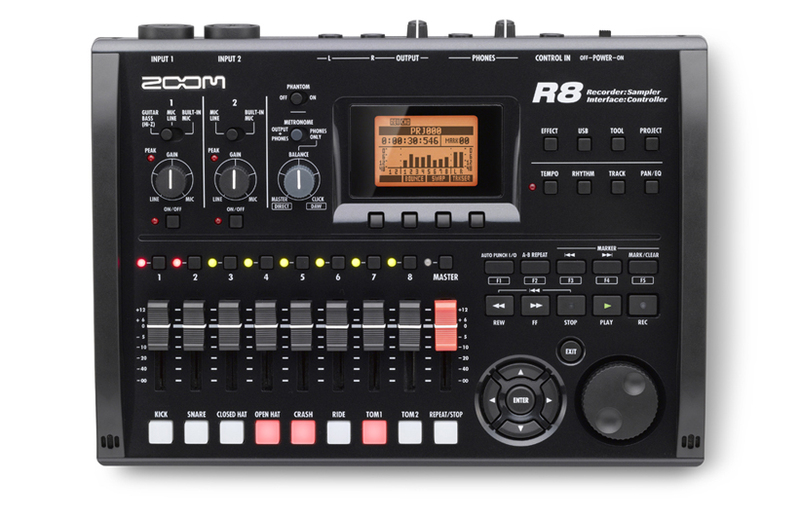 The R8's rhythm machine includes 10 types of drum kits that use linear PCM audio samples. Use the touch-sensitive drum pads to program up to 511 of your own beats, and use the rhythm patterns that you create just like audio loops. Use the R8's pads to start playback of patterns and use the R8's sequencer to arrange them into songs. You can start fast with the 472 preset patterns, which include intros, fills, endings and other phrase variations. The built-in high-sensitivity stereo microphones are convenient for recording sketches of musical phrases and melodies as they come to mind. Use these mics for clear recordings of vocals and acoustic instruments. The DSP effects, which include 146 types and 370 patches, can be used for recording, mixing and mastering. Insert effects are comprised of seven modules and include algorithms for guitars, basses, vocals and other sounds. One insert effect can be used simultaneously with the two types of send-return effects. 18 types of guitar amplifier models from our best-selling G2Nu and 6 types of bass amp models are included, so you can re-create a realistic amp sound simply by connecting a guitar or bass directly to the R8. The R8 uses compact and readily-available SD and SDHC memory cards as recording media. Unlike tape and disk recorders, this unit has no motor, making it more resistant to physical interference and concerns about mechanical noise. Set up to 100 markers and directly move to them whenever you want. Also, use the A-B repeat function to play or re-record a designated interval and use auto punch-in and punch-out for efficient editing. The R8's Hi-Speed USB 2.0 port allows WAV-format audio files recorded on the R8 to be sent to a computer smoothly and rapidly. Use the R8 with a computer for additional music production, including editing with DAW software, creating original CDs and importing WAV files. The two balanced XLR-1/4-inch combination inputs can provide phantom power, so you can use studio-class condenser microphones to make professional-level recordings. One channel also includes a Hi-Z switch, allowing guitars, basses and other high-impedance instruments to be recorded. The R8's built-in tuner is great for quickly tuning instruments and checking vocal pitch. The metronome can provide a click track for a drummer during recording and is also useful in practice settings. The metronome can also be sent to just the headphones. This allows you to play along to backing tracks previously recorded on the R8. Power options provide flexibility for different situations. Power the R8 on its own in one of two ways-with the included AC adapter or four alkaline AA batteries. The R8 operates for over 5 hours on batteries, plenty of time for most field recordings. When using the audio interface or control surface functions, the R8 can be powered by the computer's USB bus. Using a ZOOM FS01 footswitch (sold separately), you can control the recorder transport (play, stop, rewind), punch-in for recording and change effect patches with your foot. With the R8, you can easily record without ever taking your hands off your guitar. Cubase LE is a powerful music production software for recording, editing and mixing both audio and MIDI tracks. Cubase LE uses an audio engine that is equivalent to software that have received numerous awards and is an ideal introduction to computer-based music production. * USB hub is not supported. * Intel® Chipset is recommended. ●Windows®, Windows® XP, Windows® Vista and Windows® 7 are registered trademarks of Microsoft Corporation. ●Macintosh, Mac OS and Logic are registered trademarks of Apple Inc. ●The SD and SDHC logos are trademarks. ●Intel and Pentium are registered trademarks of Intel Corp. ●Mackie Control is a registered trademark of LOUD Technologies Inc. ●Sonar is a registered trademark of Cakewalk, Inc. ●All other trademarks, product names, and company names mentioned in this documentation are the property of their respective owners. ●All features and specifications are subject to change without notice.